Before our stuff gets packed away and shipped across the ocean I am trying to get all my scrappy assignments taken care of so I will have some things to share in the interim! First up, my June layout for the Kerri Bradford design team! DESCRIPTION: This is one of those rare layouts where I began without something in mind. It all started with the dahlia background and went from there. JOURNALING SAYS: I don't know if I've ever seen you as happy as in this moment at the beach in Nice! HOW TO: Die cut the dahlia background from scratch cardstock and use it as a stencil along with modeling paste to create a texture on a white cardstock background. 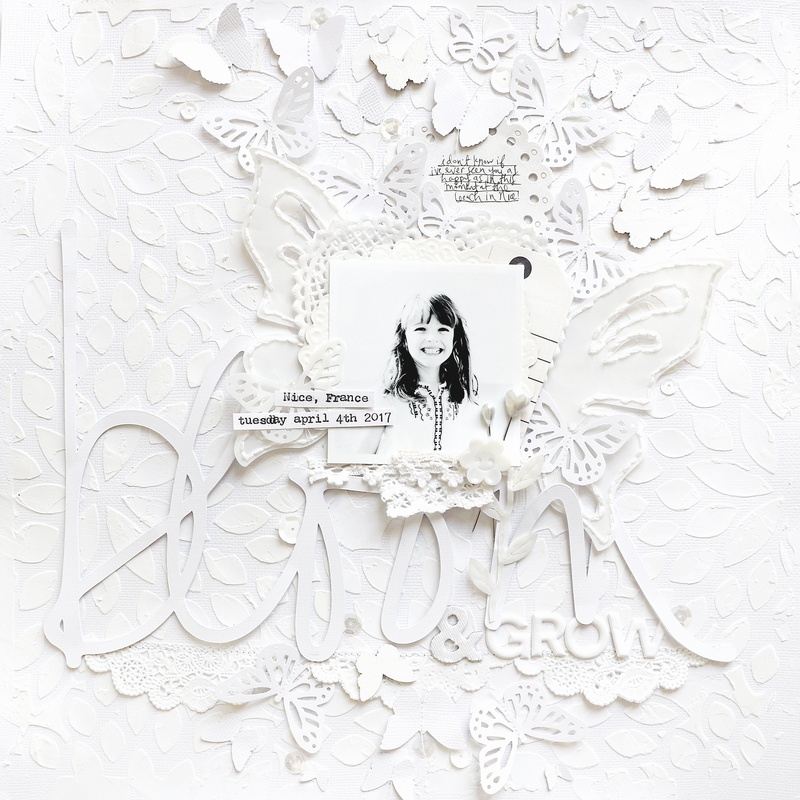 Die cut "bloom" from smooth white cardstock and adhere it near the bottom. Punch butterflies from cardstock and machine stitch through the centers. Paint three wood veneer butterflies white. Die cut a larger butterfly from vellum and hand stitch the details (trim it in half). Layer a black & white photo over doilies and tags above the title then adhere all the butterflies above and below. Accent with ribbons, a button, pearl stickpins, and a typed caption. Write the journaling on a small doily and finish the title with Thickers. I love making monochromatic pages and even mini albums because it's all about the TEXTURE!! Wowwwwwwwwwwwwwww! Even though it is all one color, it packs all the goodness!!!!!!!!! I loveeeeeeeeeeeeeeeeee this!!!!!!!!!!!!!!!!!!!! Wow this is so beautiful! Completely different from your usual style but still completely you! This is absolutely stunning, Paige! Wow!